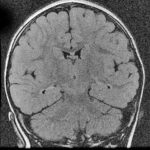 Magnetic resonance imaging uses time-varying electromagnetic fields to produce images that reflect regional biophysical properties of the CNS. MRI thereby provides unparalleled evaluation of the brain and spinal cord parenchyma. 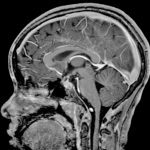 Where available, MRI is the preferred method for evaluation of most CNS abnormalities. Superior parenchymal contrast: MRI provides excellent soft-tissue contrast. Multiplanar imaging: MR images can be obtained in any plane, including axial, coronal, and sagittal. No ionizing radiation: MRI does not use x-rays or other ionizing radiation. 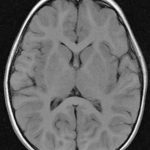 Limitations: Typical brain MRI examinations require 20–25 minutes, and the patient must remain motionless during this time. Sedation is often required for younger children. MRI is also expensive. Vary sequences to vary tissue contrast: On MRI, contrast between brain structures varies widely depending on the technical parameters of acquisition (i.e., the imaging “sequence”). Typically, multiple MRI sequences are obtained to highlight differing structural or functional brain features. 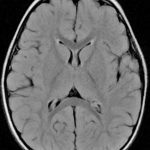 Image intensity depends on myelin: In the normal CNS, MRI image intensity depends heavily on myelination state. 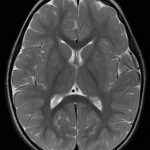 Signal intensity of the CNS parenchyma evolves rapidly during the first two years of life with progressive myelination. Always check scan’s laterality: According to radiologic convention, left-sided structures are presented on the viewer’s right. However, the neurological convention is occasionally used, in which laterality is reversed. Viewers should attend to the directionality labels (L/R and A/P) presented at the margins of the MR images. Standard anatomical MRI provides excellent spatial resolution and soft-tissue contrast. 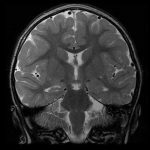 A typical MRI examination includes several distinct sequences, obtained with varying scanner settings, which highlight specific features of the nervous tissue. 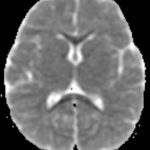 T1-weighted images: The relative intensity of gray and white matter varies according to its myelination stage—the mature pattern is shown below. The CSF is dark. The T1 sequence is excellent for the evaluation of anatomy. 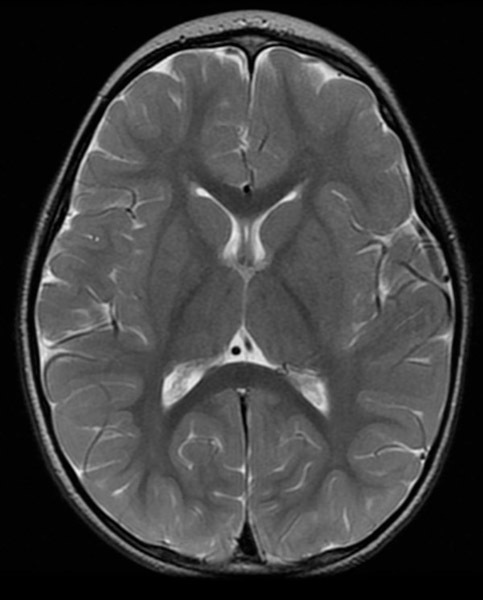 Axial T1-weighted MRI: The CSF is very dark whereas the brain’s parenchyma has an intermediate intensity of gray. Sagittal T1-weighted MRI: The CSF is very dark whereas the brain’s parenchyma has an intermediate intensity of gray. 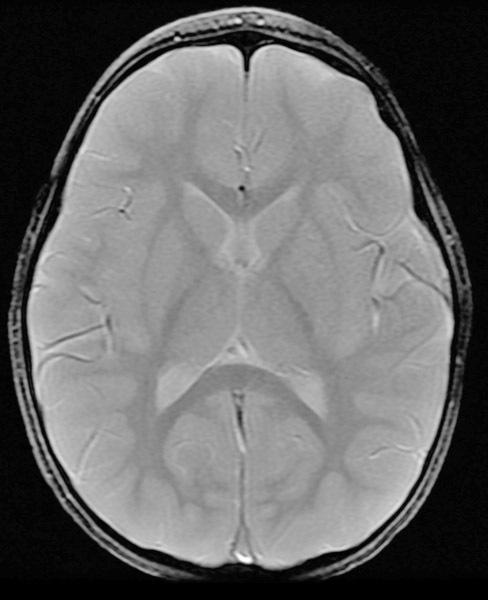 T2-weighted images: Fluid, including CSF, is bright on this sequence. 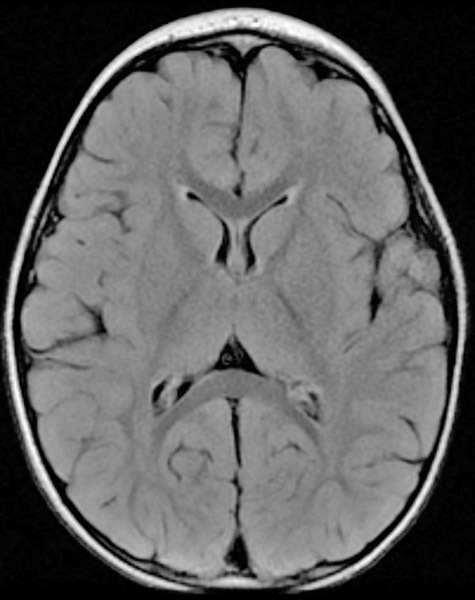 The relative intensity of gray and white matter varies according to its myelination stage—the mature pattern is shown. This sequence is excellent for the demonstration of anatomy, evaluation of hydrocephalus, and identification of CNS tumors. FLAIR images: This sequence is similar to T2-weighted images, except that the signal from CSF is suppressed. 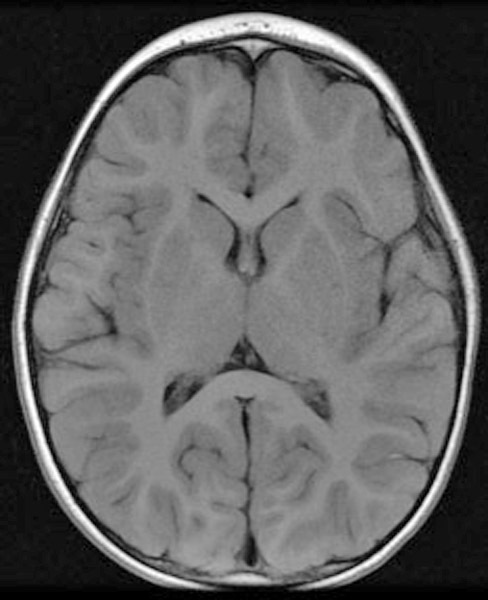 Parenchymal abnormalities, including edema and gliosis, are accentuated. 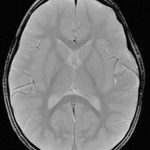 FLAIR imaging is the most sensitive MRI method for identification of acute subarachnoid hemorrhage. 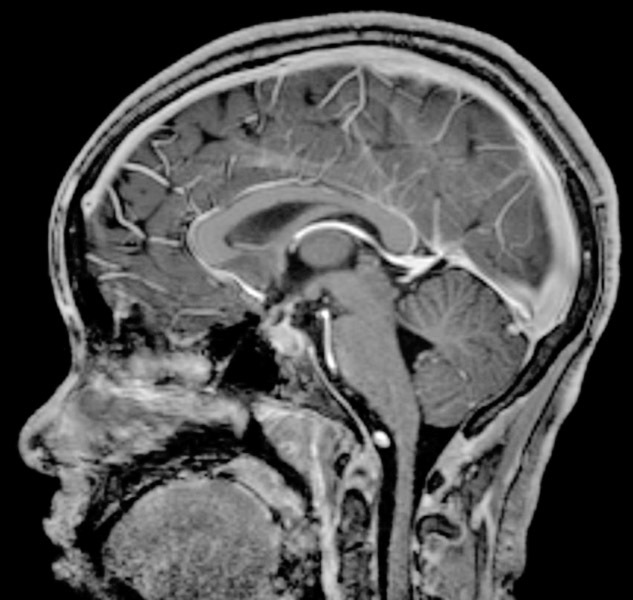 Axial FLAIR MRI: Similar in appearance to T2-weighted images, except that signal from CSF is dark because it is suppressed. 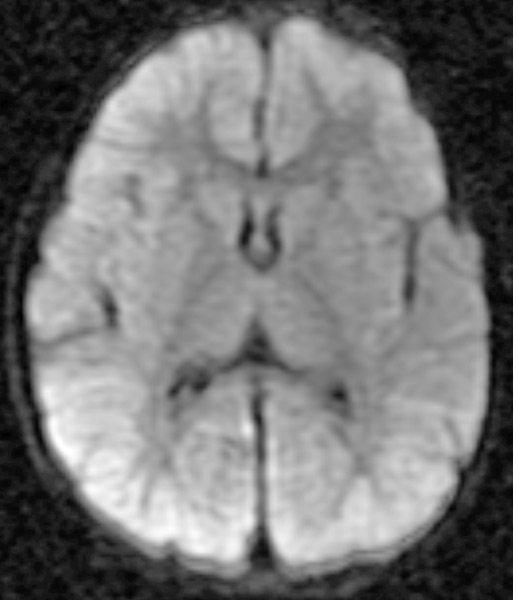 Coronal FLAIR MRI: Similar in appearance to T2-weighted images, except that signal from CSF is dark because it is suppressed. T1-weighted post contrast: Gadolinium-based contrast material, injected intravenously, results in increased signal intensity on T1-weighted images. This increase in signal is called enhancement. Normally, the blood–brain barrier restricts enhancement of the CNS parenchyma so minimal increase in parenchymal signal intensity is expected. When the blood–brain barrier is disrupted, as is the case with many tumors, the area of disruption will “enhance” or appear more intense than normal brain. Some intracranial structures enhance normally including blood vessels, the choroid plexus, the pituitary gland, and the pineal gland. Sagittal T1-weighted gadolinium-enhanced MRI: Gadolinium-based contrast material has been injected intravenously. 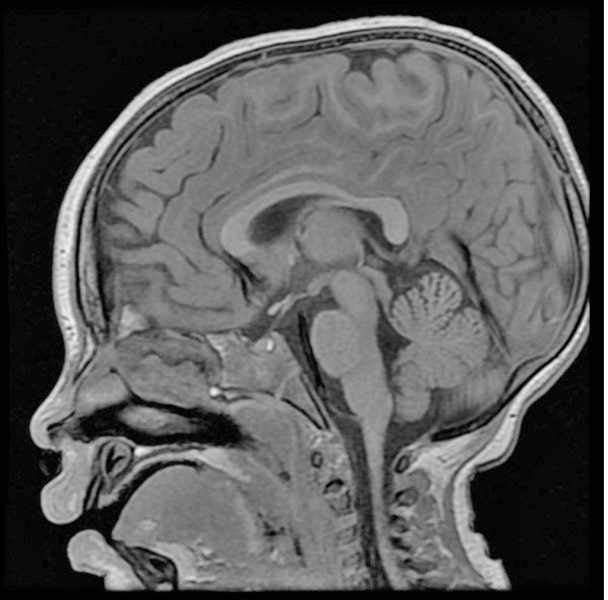 Note the brightly appearing vessels of the brain and its coverings that are not seen on the nonenhanced T1 weighted images above. Axial T1-weighted gadolinium-enhanced MRI: Gadolinium-based contrast material has been injected intravenously. 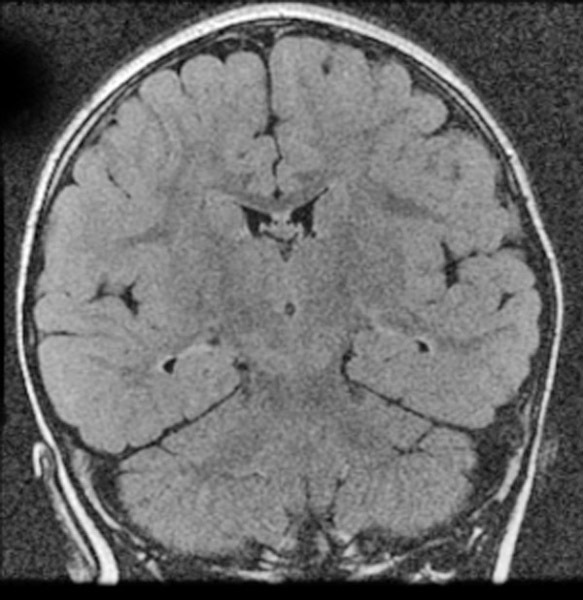 Note the brightly appearing vessels of the brain and its coverings that are not seen on the nonenhanced T1 weighted images above. GRE images: This sequence is sensitive to susceptibility artifacts arising from calcification or blood products, showing them as intensely dark. 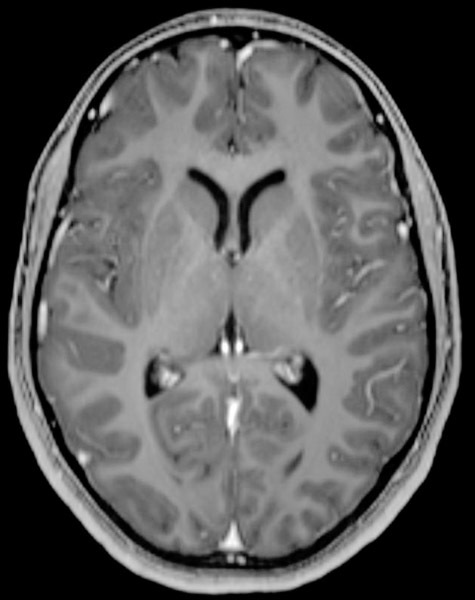 Axial GRE MRI: The intensity of the CSF and parenchymal tissues is intermediate whereas calcium (rim of skull surrounding the brain in this image) and hemosiderin are very dark. 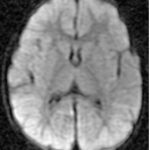 Diffusion-weighted MRI: Diffusion-weighted imaging (DWI) is crucial for the identification of acute infarction, which may be invisible on other sequences. Certain tumors also demonstrate diffusion abnormality. Diffusion-weighted image: Image brightness on DWI depends on a combination of the diffusion coefficient of water and the underlying T2-weighted signal intensity. The images will be brighter in regions of abnormally restricted diffusion (e.g., an acute infarct) or increased T2-intensity (e.g., gliosis). These effects can be distinguished through analysis of maps ADC (to right). Apparent diffusion coefficient (ADC) map :An ADC map provides a quantitative estimate of diffusion properties independent of underlying T2-intensity. Regions of free diffusion (e.g., gliosis) will be bright whereas regions of restricted diffusion (e.g., acute infarct) will be dark on ADC maps. MR angiography is a variant of MRI that evaluates presence of blood flow in arteries and veins. No contrast: Intravenous contrast is usually not required. 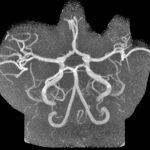 Vessel pathology identification: Allows identification of aneurysms and other vascular anomalies. This technique is useful in the evaluation of patients with ischemic stroke. 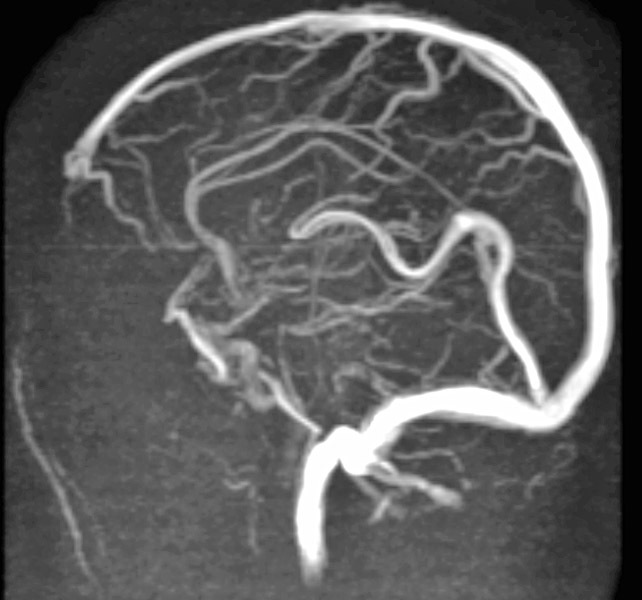 Venography: Similar techniques allow demonstration of the intracranial veins (MR venography). 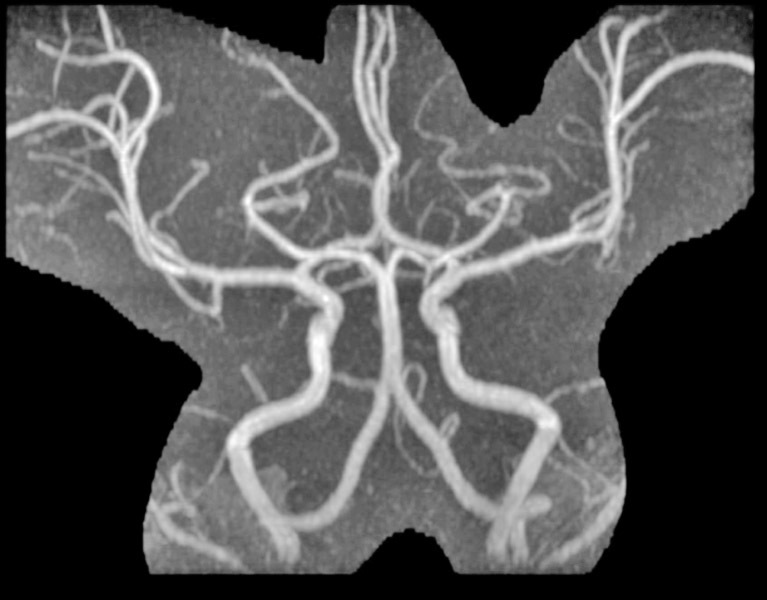 Axial MR angiogram: The major intracranial arteries and their proximal branches are demonstrated. 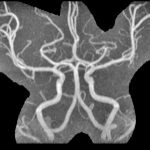 Coronal MR angiogram: The major intracranial arteries and their proximal branches are demonstrated. 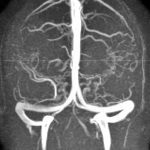 Coronal MR venography: Acquisition parameters can be chosen to favor venous flow, producing an MR venogram. The major intracranial veins and venous sinuses are demonstrated. The largest arteries can also be faintly seen. 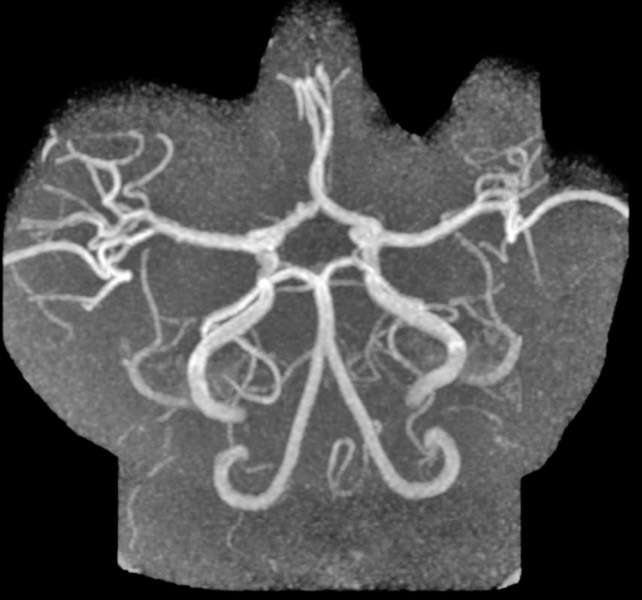 Sagittal MR venography: Acquisition parameters can be chosen to favor venous flow, producing an MR venogram. 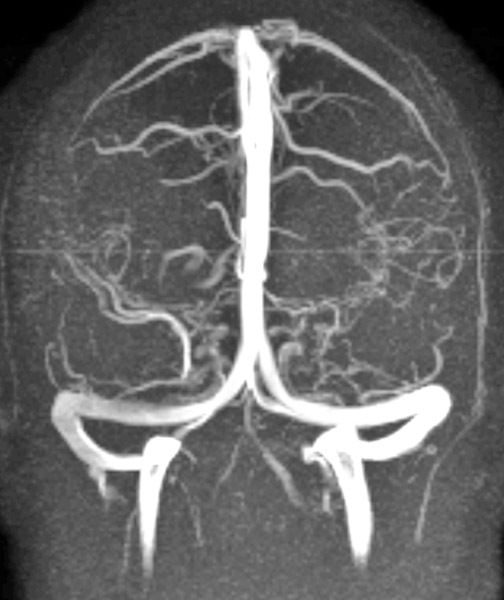 The major intracranial veins and venous sinuses are demonstrated. The largest arteries can also be faintly seen. MR imaging can be used to evaluate the pulsatile flow of CSF through the ventricular system and CSF cisterns. Applications include assessment of CSF flow at the foramen magnum in children with Chiari malformations and for the evaluation of third ventriculostomies. CSF flow images: Change in signal intensity of CSF at the foramen magnum indicates normal pulsatile flow. 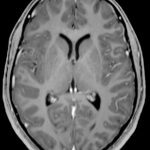 Third ventriculostomy image: Change in signal intensity of CSF within third ventricle and suprasellar cistern due to flow through opening in the floor of the third ventricle just behind infundibular stalk (a so-called third ventriculostomy). 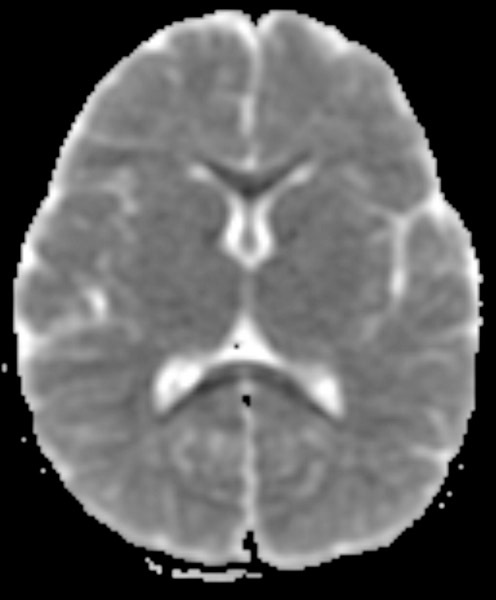 DTI is a variant of DWI that allows the evaluation of white matter structure and integrity. In particular, the predominant direction of axonal fibers can be determined. 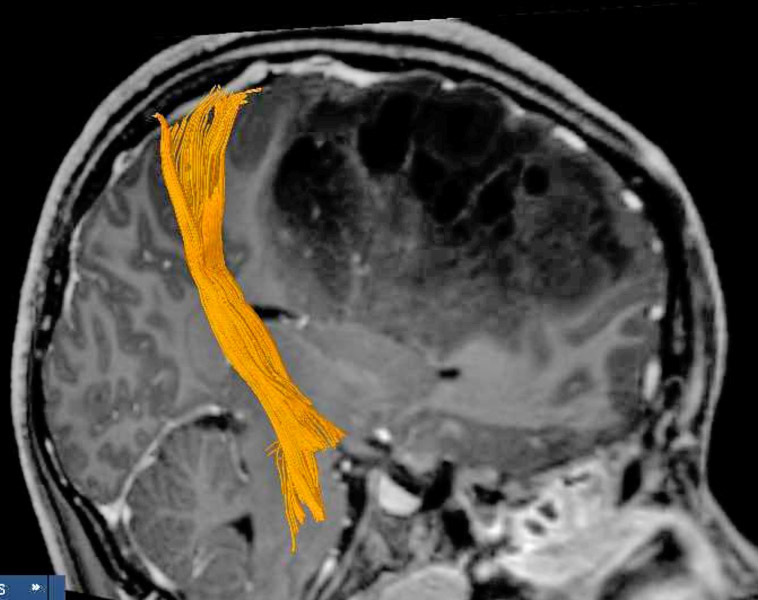 Using a post-processing technique, diffusion tractography, the position and course of white matter tracts can be estimated. Analyzes white matter structure: DTI is an MRI method that allows evaluation of regional white matter structure. Identifies white matter tracts: Diffusion tractography is a post-processing technique applied to DTI data. It allows white matter tracts, such as the corticospinal tract, to be identified. 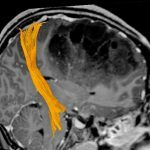 Presurgical planning: Diffusion tractography facilitates presurgical planning in children with brain tumors. DTI of right corticospinal tract: The right corticospinal tract is demonstrated by DTI in a patient with a large right frontal lobe tumor. 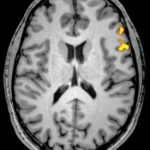 fMRI aims to demonstrate the cortical regions important for specific functions, such as motor control and language. This is accomplished through identification of the subtle changes in blood flow that accompany neuronal activation. Speech and motor function maps: fMRI allows eloquent cortical regions to be identified. 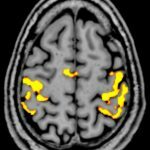 Common uses for fMRI include the lateralization of language function and identification of the primary motor cortex. 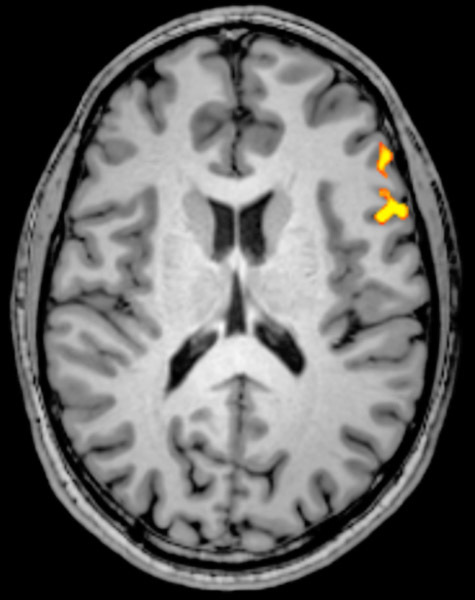 Axial fMRI for speech: fMRI image shows activation (orange) in Broca’s area during a language task. 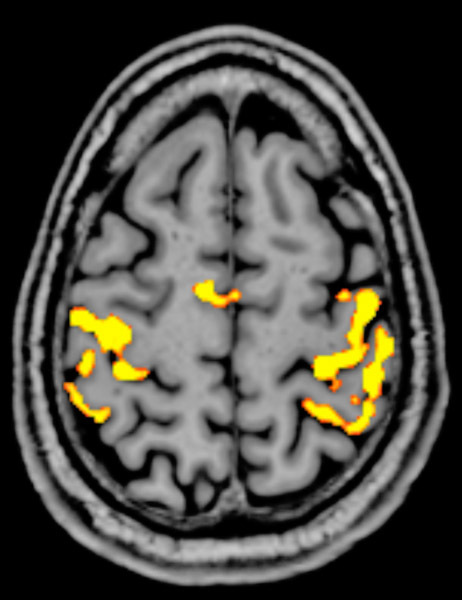 Axial fMRI of primary motor and sensory cortex: fMRI shows peri-Rolandic activation (orange) in a finger-movement motor task. PWI allows the timing and degree of brain perfusion to be measured. 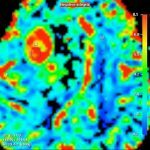 Tumor grading: High-grade brain tumors typically demonstrate increased perfusion relative to normal brain. 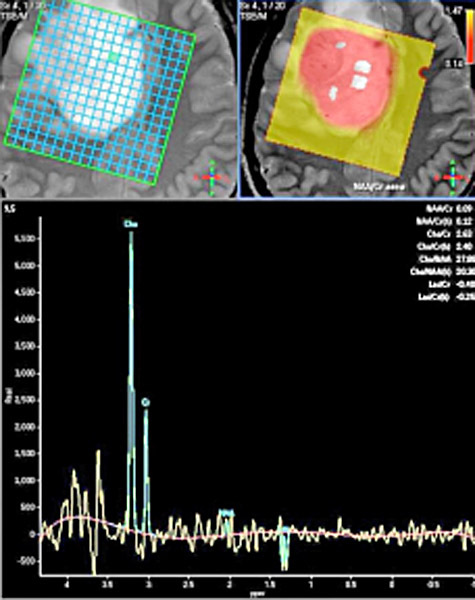 Using PWI, the perfusion characteristics of a brain tumor can be measured. Within certain limits, tumor grade can be predicted. 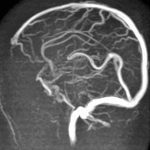 Vascular stenosis: Hemodynamically significant arterial stenosis leads to delayed cerebral perfusion. This delay can be identified with PWI. Uses include the evaluation of brain perfusion in patients with known or suspected arterial stenosis. Perfusion-weighted MRI: False color map showing elevated cerebral blood volume (red color) in a high-grade tumor of the right frontal lobe. 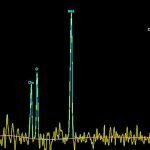 MRS is a variant of NMR spectroscopy that allows the noninvasive measurement of certain brain metabolite (6). Identifies metabolites: Numerous metabolites can be identified, with varying efficiency. For clinical purposes, choline (Cho), creatine (Cr), n-acetylaspartate (NAA), and lactate are the most important. Choline elevates in multiplying cells: Choline is increased in rapidly dividing cell populations. 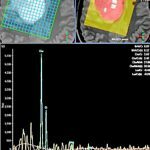 This property can be used to predict the histological grade of some brain tumors. 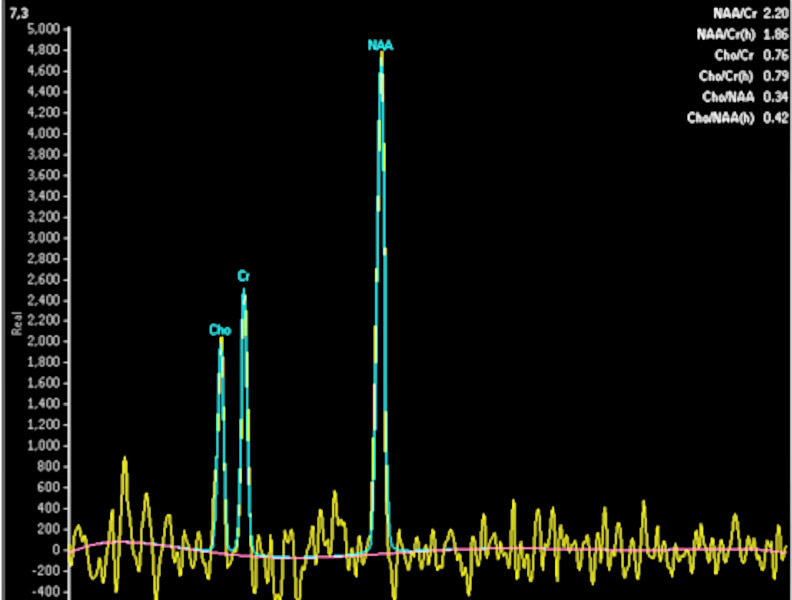 Normal MR spectroscopy: Normal brain spectrum shows expected levels of Cho, Cr, and NAA. Spectroscopy malignant tumor: MR spectroscopy of a high-grade brain tumor shows elevated Cho.